Oxford University Press, USA, 9780195380019, 305pp. An administrator known for her innovative on-the-job thinking becomes the target of anonymous rumors about financial mismanagement of her department. The rumors are proven baseless but her boss decides that she can't work with "that woman" anymore and prevents her from attending key meetings. The administrator sees a cardiologist for the first time in her life because of increasing chest pain, and her family doctor prescribes antidepressants "to get her over the hump." The administrator whose identity is interwoven with her job and company is bewildered by what is happening to her at work and says she doesn't know who she is anymore. A middle school student is the target of relentless name-calling and slurs by a group of other kids at school. The slurs include derogatory comments about his sexuality, appearance, and family. The taunting has increased over several months, and many teachers have witnessed it. The student was the subject of a recent conversation in the faculty lounge, where some faculty members said the student needed to "toughen up," while others expressed concern for his well-being. The student's main strategy has been to try and keep away from the group of kids, but he finds himself trusting fewer of his "friends," feeling both angry and sad, and having a hard time concentrating. What features of these two situations are almost identical, and why are they both classic instances of workplace and school mobbing? Mobbing is not the same as bullying, as the authors of this volume explain with cogent analysis of the organizational and contextual frameworks within which mobbing always occurs. From the Salem witch trials to workers trying to do the best they can at work, to kids whose humiliation in school has made the headlines, the authors offer numerous illustrations of mobbing, followed by insightful analyses and discussions of lessons learned. 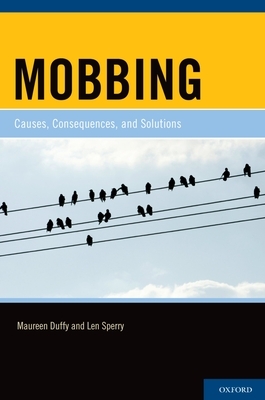 Duffy and Sperry provide a wealth of research to demonstrate the devastating toll that mobbing takes on its victims, their families, and the organizations where it occurs. The authors painstakingly avoid simplistic solutions to mobbing, such as removing the "bad apples," and instead, move the conversation forward by showing how bold and compassionate organizational leadership is required to improve conditions for the benefit of both individuals and their organizations. Maureen Duffy is a highly experienced family therapist with an active clinical and consulting practice that includes clients who have been injured as a result of mobbing. She was formerly Professor of Counseling at Barry University, where the counseling clinic is named in her honor. Currently, she is affiliated with Nova Southeastern University's program in qualitative research and with Massey University's program in discursive therapies. Her work in the area of social justice includes multiple articles, book chapters, and national and international presentations on mobbing, ethics, and restorative justice. Duffy serves on the editorial boards of several major family therapy journals and is an editor of The Qualitative Report. Len Sperry is Professor of Mental Health Counseling at Florida Atlantic University and Clinical Professor of Psychiatry and Behavioral Medicine at the Medical College of Wisconsin, where for years, he directed the Division of Organizational Psychiatry and consulted widely with professional organizations and Fortune 500 corporations. He has published broadly on workplace issues, including six books on leadership and organizational dynamics, as well as articles and book chapters on workplace violence and mobbing. He was guest editor for special journal issues on "Aggression in the Workplace" and "Workplace Mobbing and Bullying."